Executive Chef Ludovic Pitrel of the Restaurant Eden - Zurich, Switzerland shares a tantalizing recipe for Scallops with Sangria Sauce, Caramelized Endives, Croquant of Poppy Seeds, and Garlic. Some chefs remind me of excited kids in a candy store; Executive Chef Ludovic Pitrel of the 14 points GaultMillau rated Restaurant Eden, is one of them. Paris-born, he decided to become a chef at age 14 years, and interned at the legendary Maxim in Paris. Since then, he has flowed with ease back and forth from France to Switzerland, gathering new and exciting ideas along the way from his travels around the world. He believes that you must "Cook with your heart. We do not make food, we cook, and we must always taste." His inspires other chefs, including his brother, who is now studying to be chef. After working at the Ermitage am See (Küsnacht), Davoserhof (Davos), Barometer and Carlton (Zurich), he joined Restaurant Eden in November 2004, where he added another GaultMillau point to the restaurant in October 2006 for a total of 14 points. I had dinner at Restaurant Eden in October 2006 during my stay at the Hotel Eden au Lac, and had the opportunity to sit with Chef Pitrel and learn about his cooking style, which reflects strong Mediterranean but modern flavor, and influences from Morocco and North Africa. He is always looking for something new for the kitchen and likes to meet other chefs and exchange ideas. He never asks for the recipes, if he sees it, he will try it, and likes to combine intriguing textures and tastes. 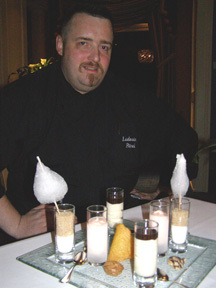 Chef Ludovic Pitrel is someone who seems to be in perpetual motion, and his enthusiasm is contagious. He spends his time relaxing by going to the movies, playing darts, and traveling. His travels have recently taken him to Key West, New York (where he loves Smith & Wollensky), Singapore, and Las Vegas, which he loves, and has become a regular visitor. His kitchen is inspired, and everything is homemade from the noodles and ravioli to the ice cream, which definitely recalled the candy store as I sampled his Bubble Gum Ice Cream and Cotton Candy. He believes that "Dessert has to be even more fantastic as the final souvenir," which definitely made him a chef after my heart (and my sweet tooth), and said that he once had a five-course dessert-only menu; I told him to call me the next time he plans to have another one! Marinate for 48 hours in the refrigerator; pass through a fine-mesh sieve before gently reducing to a syrupy consistency. Mix the icing sugar and the butter until you obtain a white cream. In a pan, boil the glucose with the milk, then add to the white cream, and finish by adding the poppy seeds and the garlic. Preparation: Roast the scallops with a little salt, olive oil, and pepper. Cut the endives lengthwise into thin slices. Caramelize on low heat with olive oil, butter, and brown sugar. The croquant must be cooked in the oven at 200° C (400° F) on baking paper (parchment). The sangria sauce should be served at room temperature. Garnish with Fleur de Sel and a deep-fried thyme branch. Read the articles on the Hotel Eden au Lac in the Hotels and Resorts, and Restaurants sections. 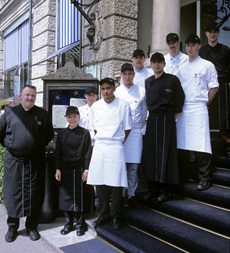 The Hotel Eden au Lac is part of the Victoria-Jungfrau Collection, www.Vctoria-Jungfrau-Collection.ch.